I can’t say enough nice things about this Simplicity 2907 pants pattern. It’s unisex, it’s simple to make, pops onto the baby easily with an elastic waist, and its four-part design allows for cutting a variety of styles. 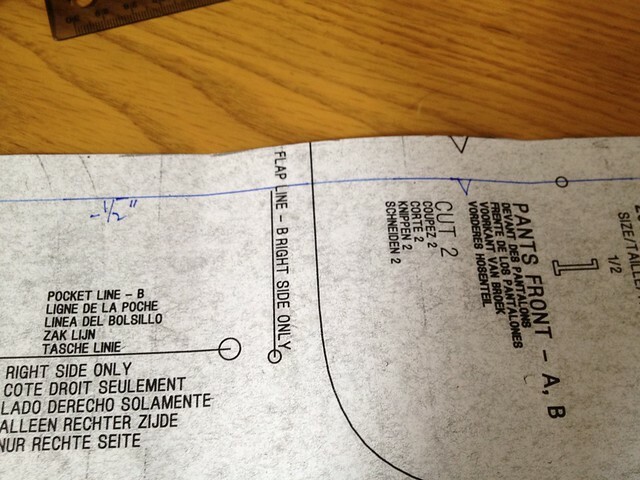 And using the same pattern over and over means working faster without cutting corners. 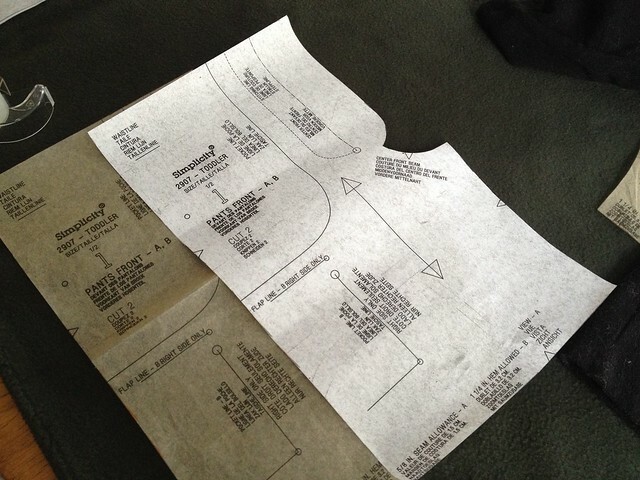 First, though, I used photocopies of the pieces to make the pants a little bit skinnier. 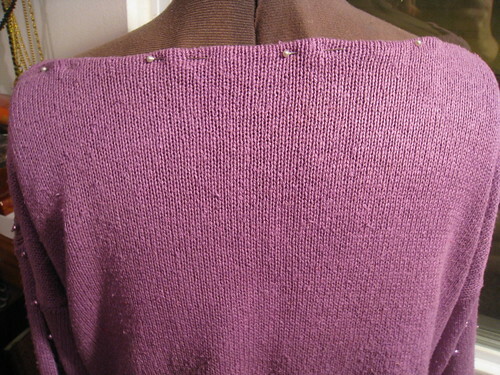 Took 1/2″ off each side; Mr. Baby is long and lean. 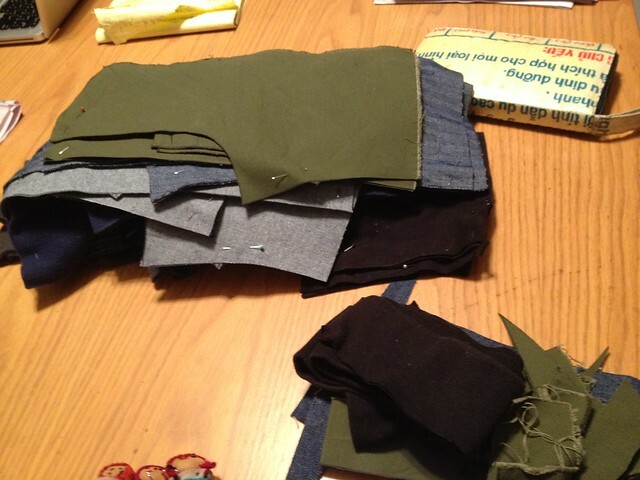 Then I lined up the fabrics on the dining room table Sunday and traced and traced and traced. Each pair needed about 1/2 yard. 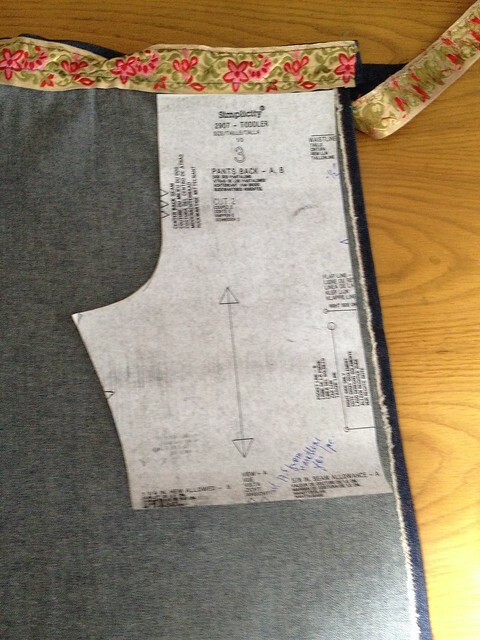 Some of the pants will be four pieces, as written. Some have solid backs but two-piece topstitched fronts. 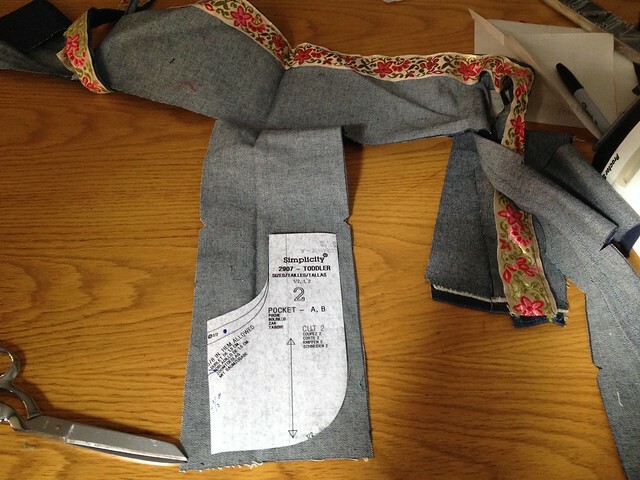 Some I converted into two-piece by lengthening the fronts by about 5 1/2 inches on each side. The wovens will get pockets, the knits and fleeces will not. Mass cutting followed. 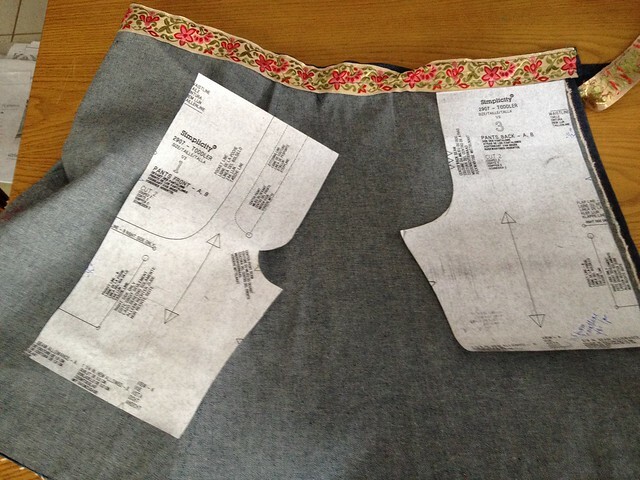 Then lots of pinning together. Then stacked according to thread color, which is how I’ll sew them, a color at a time. These four-piece pants got cut from a UFO denim skirt from a time when I had zero understanding of grain. 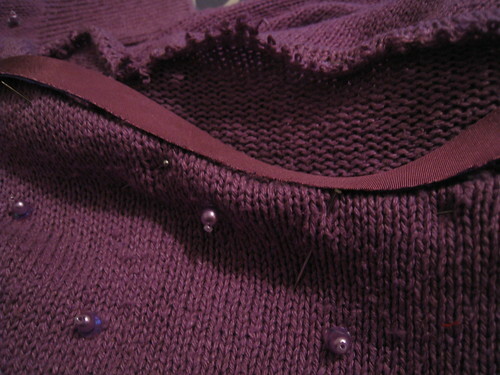 Otherwise, why would I have used straight ribbon to finish the waistband? Hence the resulting mess. Just enough left to get pockets. We’ll see if these pockets actually work. It was a tight fit in the end. One of my favorite things about a hobby like sewing is that I can do it anytime for five minutes here, for an entire afternoon, late at night, whenever. And I don’t need anyone to help. So the success of online social sewing threw me for a loop. I don’t participate in tons of community sewing projects because they turn something I quietly enjoy at my own pace into another something I have to get done. 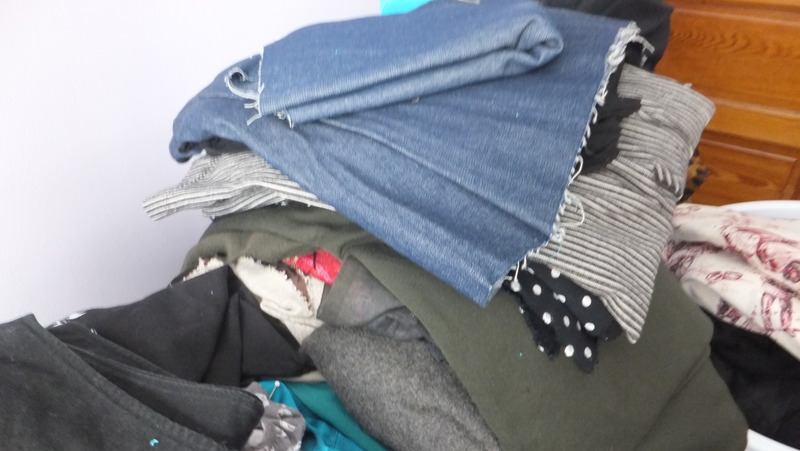 That rant aside, I’m going to try this Kids Clothes Week 2015 challenge or sew-a-long or whatever it is. Chock full of good ideas. Some giant sweatshirts and t-shirts and sweaters that’ll chop up well for Mr. Baby are taking up space in the sewing room. And maybe I’ll find some good ideas for little boys. I guess I’m signed up here. 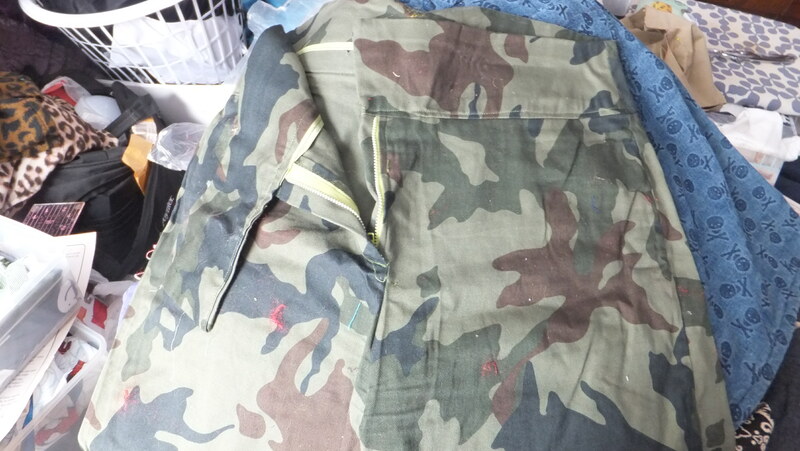 It only takes about 1/3 of a yard of fabric to make shorts for Mr. Baby, who’ll be about 18 months old when the cold breaks, and about 1/2 a yard for simple pants. Which means some old duds can turn into useful clothes for him. This skirt fit ok, but I was 28 then. 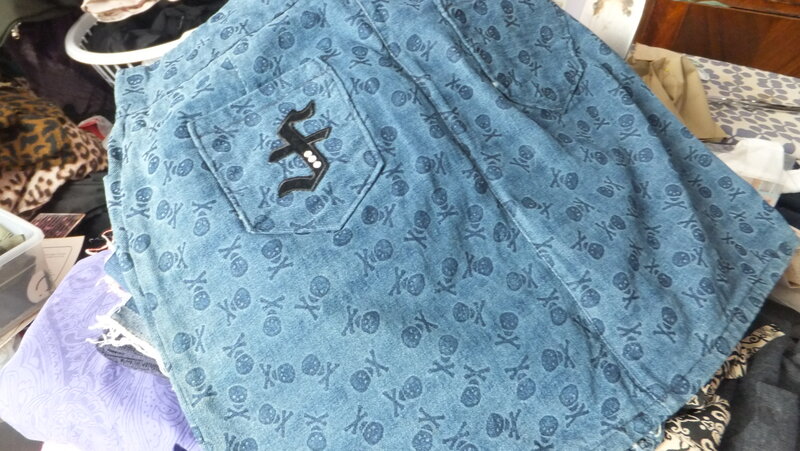 Skull denim! Same pattern in camo. Used to be a Fitz summer uniform but now way too short. 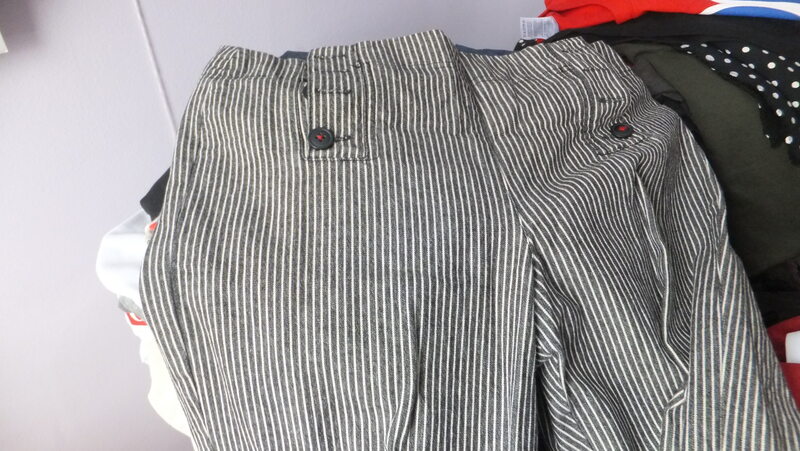 These pants will shorten into shorts for me, and the excess leaves enough for shorts or even pants for him. 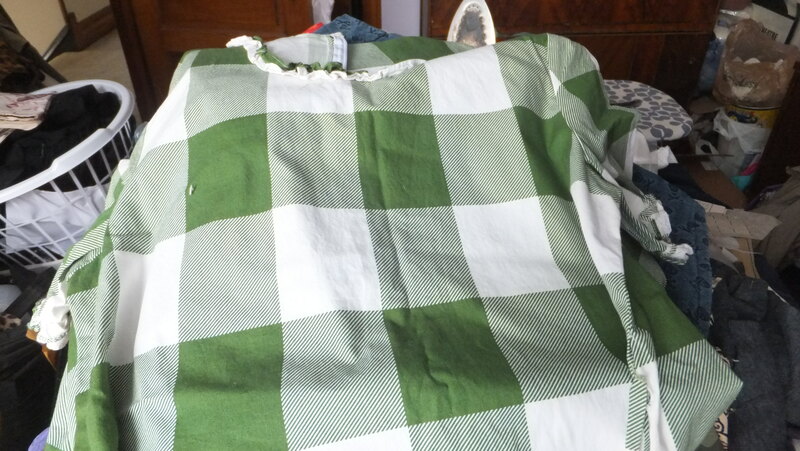 And this goofy dress – enough fabric for a whole romper – is a perfect green giant plaid for him. Who else can credibly wear giant green plaid? 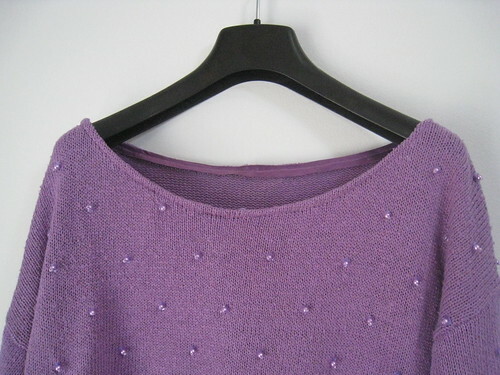 I loved this silk cotton purple sweater with the pearls all over the front and the sleeves. 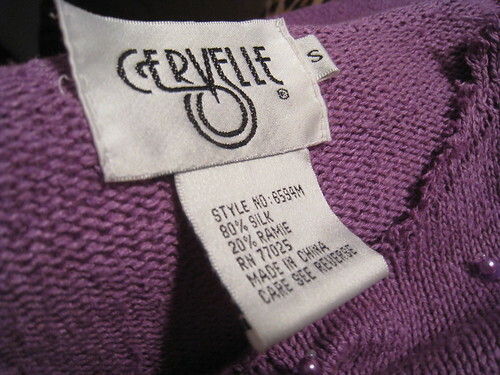 But the original crew neck was such an ugh. It was so ugly, I never photographed it at all. Picked at this sucker over months, trying to figure out the best way to fix it and then getting up the nerve to cut into this baby, too. 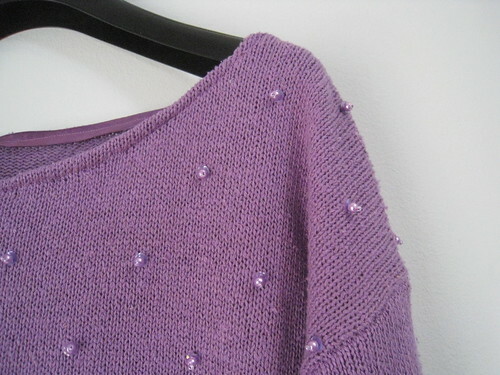 Finally I unraveled the knitted crew neckband. 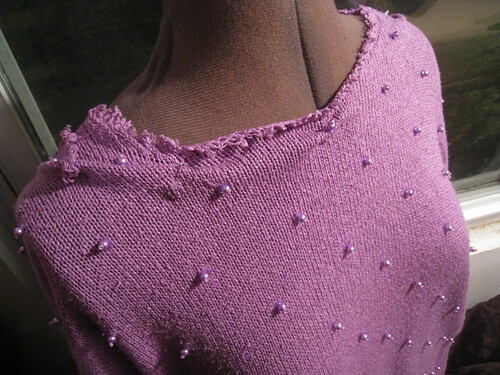 Pinned the fabric back into a bateau neckline. Picked off the couple pearl beads in the way. 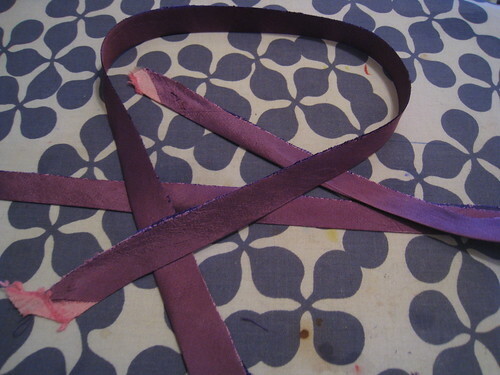 Then I cut bias strips from the back side of some old irridescent purple taffeta because it was a pretty close match to this lilac color. 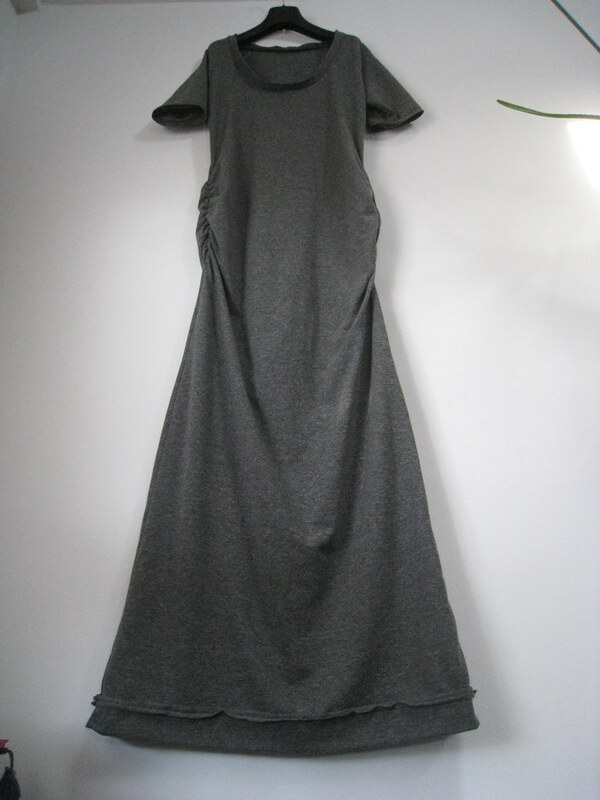 The taffeta’s light enough that it doesn’t add bulk, and the bias means the neckline will give a little. 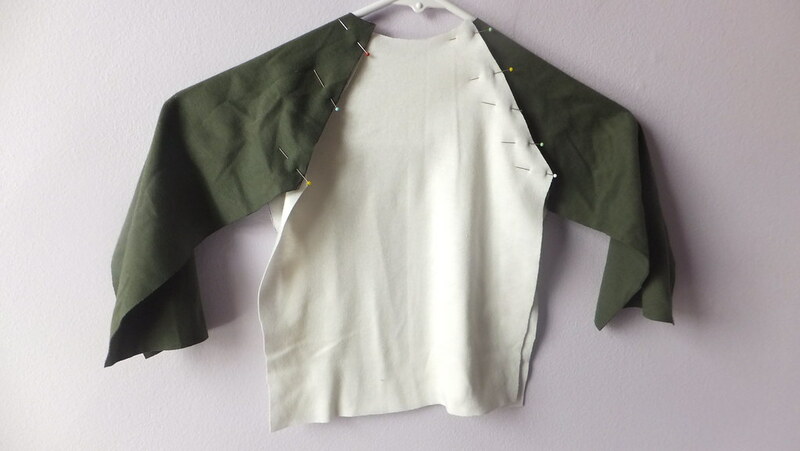 Pinned them in place, wrong sides together, sewed. Pressed them back out, pinned pressed and sewed. 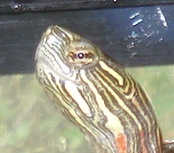 Can you change a turtleneck? 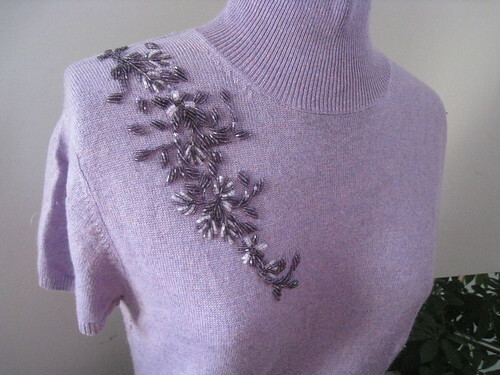 Stunner of a silk sweater. Perfect color. 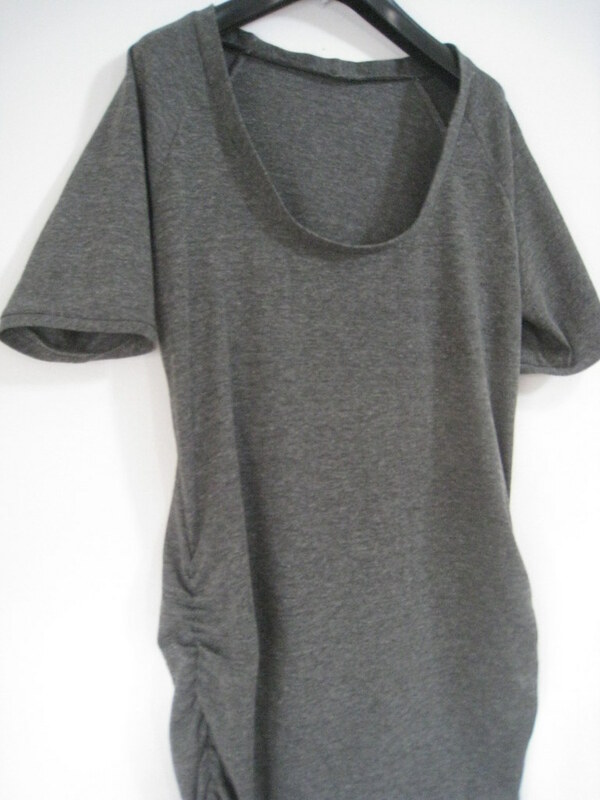 Love the little sleeves. 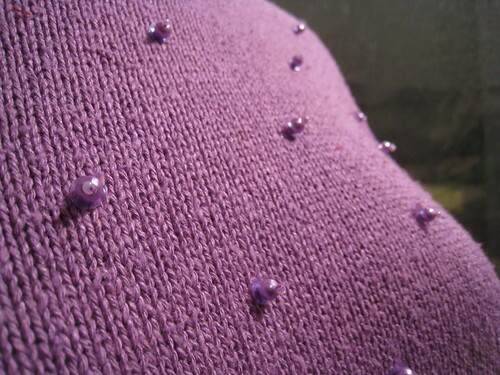 Beads on one shoulder. 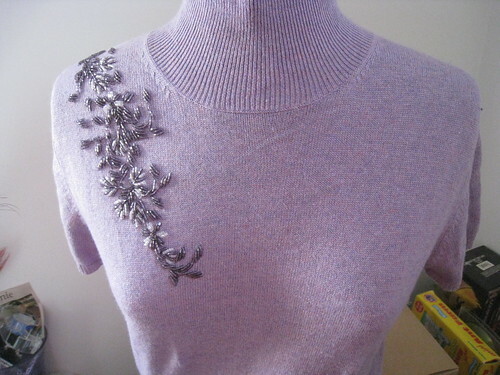 I’m wondering if it’s possible, without wrecking the sweater, to turn the turtleneck into a crew neck or jewel neck. 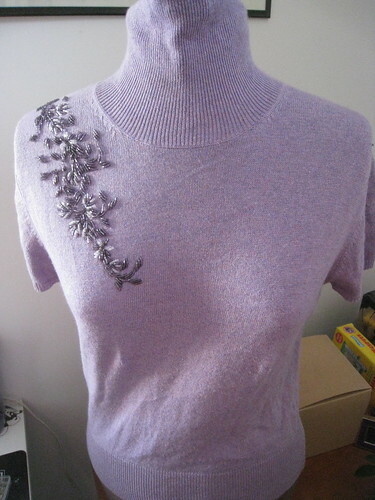 Could I stay-stitch the neckline I want, then gently and invisibly bind it?